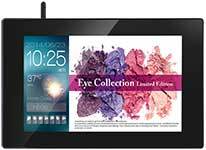 The ViewSonic EP1032r-T is a 10" multimedia all-in-one interactive electronic mini billboard It delivers eye-catching touch-interactive commercial messaging at retail POS, hotel lobbies and front desks, conference and exhibition venues, and other high-visibility locations. The EP1032r-T features wireless b/g/n network and LAN connectivity for easy loading of content, and supports Power over Ethernet (PoE) for convenient one-wire installation. Multi-touch compatibility with HTML5 and SMIL formats delivers a 2-way interactive platform for dynamic, customized content. 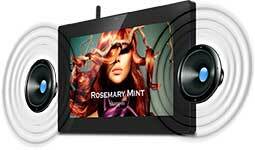 Its built-in media player, 4GB internal storage, and integrated speakers enable the playback of video clips, as well as photos and music, from a USB hard drive or SD/SDHC memory card. Bundled with Signage Manager Express software, the EP1032r-T effectively delivers customized messaging to target audiences. 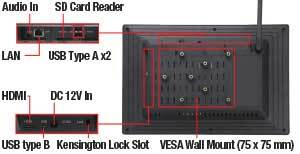 With VESA-mount compliance, the EP1032r-T is installation-ready for any high-visibility, high-traffic location. 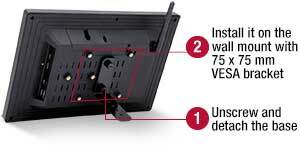 ViewSonic’s EP1032r-T all-in-one electronic mini billboard has a 10.1" display area with 1280 x 800 screen resolution. With its compact design,the EP1032r-T can be deployed anywhere, including retail shelf edges, hotel front desks, in meeting rooms, or on classroom doors. The EP1032r-T features 300-nit brightness and a 500:1 contrast ratio to deliver high-impact, quality messaging that will attract the attention of passersby. 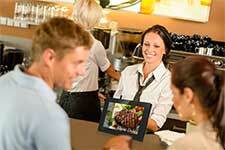 The EP1032r-T delivers on-demand advertising and messaging while increasing two-way communication with customers. 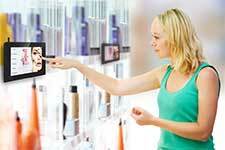 With multi-touch capability, the EP1032r-T is the perfect e-catalog display solution for shelf edges, retail counters and information kiosks in high-traffic venues. The EP1032r-T utilizes state-of-the-art Power over Ethernet (PoE) technology for one-wire installation. Thisallows you to easily power and connect your displays with just a single cable. 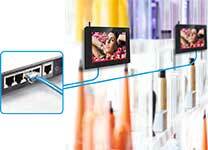 PoEalso allows you to create multi-display digital signage installations, while reducing installation costs. The EP1032r-T integrates wireless 802.11 b/g/n network and RJ45 Ethernet connectivity, providing a convenient and efficient way to load content from a PC or laptop connection. 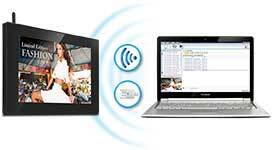 Wireless/LAN connectivity can also be used to remotely load content to multiple displays. With the handy PC-less USB playback feature, photos, music and 1080p video can be immediately displayed on-screen from a USB drive. A user-friendly on-screen scheduling interface also lets you select time, date, repeat and shuffle settings, or choose specific content to play from the attached USB source. It’s easy and efficient. 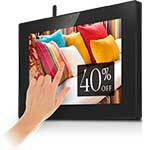 With the bundled Signage Manager Express software, the EP1032r-T can display W3C HTML5 and SMIL content retrieved from the Internet. This content management and scheduling system offers the flexibility to display fresh and interesting content such asnews, weather information, stock market trends, sports scores, social networking, or RSS feeds on multiple screens. 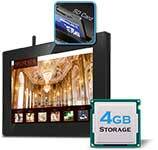 The EP1032r-T is capable of storing and playing hours and hours of high-definition multimedia content thanks to its 4GB of built-in,shock-resistant, solid-state memory. 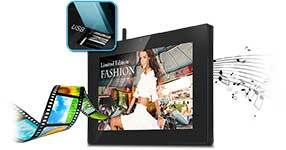 This reliable all-in-one electronic mini billboard will display dynamic content with no crashes, freezes or lost content. Integrated with a pair of stereo 2W speakers, the EP1032r-Tcombines eye-catching multimedia content with high-quality sound effects—creating an incredible audio-visual impression on your target audience. Great for all venues and scenarios, the bundled Signage Manager Express software lets users transfer multimedia content onto the EP1032r-T from PCs and laptops. This embedded content management tool also lets you format, schedule, and save playback settings. 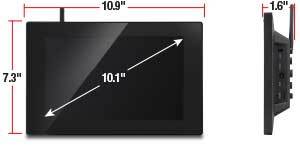 The EP1032r-T electronic mini billboard can be easily mounted on walls (VESA 75mm x 75mm) for display flexibility in a variety of settings.